At Lemon Fresh UK we are a family run company. As such we understand how much the little ones love teddy bears. This is why we have worked hard to provide a range of the cutest possible high quality teddy bears to you. Feel free to browse through our teddy bears and if you have any questions then feel free to ask. 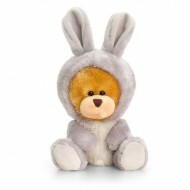 This cute butterscotch colour soft bunny is perfect for any kids that love teddy bears. With g..
Meet Pudgy. Another little Cutie. Very short haired plush bear. 7.5 inches tall with embroider..
Pogo Bear, Made by Hugs & Co is a really fluffy, long-haired, super-soft Brown bear with a cream..
A super soft and squishy cuddly teddy bear with short arms and short legs. Standing at 5 inches tall..